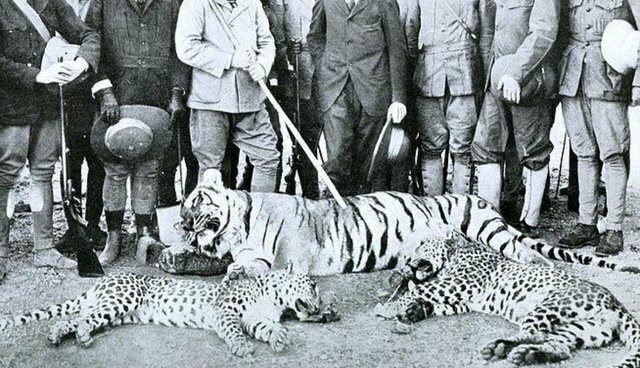 This is the first piece is the first installment of a two-part series on canned hunting throughout the history of the imperial world by Sophia Nicolov and Andy Flack, University of Bristol for the Animal History Museum. This was how Spain greeted their newly-crowned King, Felipe VI, in Madrid on June 19 this year. Felipe was taking over the throne from Juan Carlos I who announced his abdication on June 2 in favor of his son. In addition to the former king's old age and ill health, a crucial factor in his abdication was his taking part in what has become an infamous hunting trip to Botswana in April 2012 to hunt and kill elephants (see the image below). The news shocked not only the people of Spain, but the rest of the world. Popular opinion was that a monarch respected for having ushered his nation out of fascist dictatorship before developing it into a modern democracy should not indulge in a morally dubious activity that most people assumed had died with the end of Empire (and the notorious British Empire at that). Juan Carlos' elephant hunt was met with disgust and derision throughout Europe and the United States (see below). 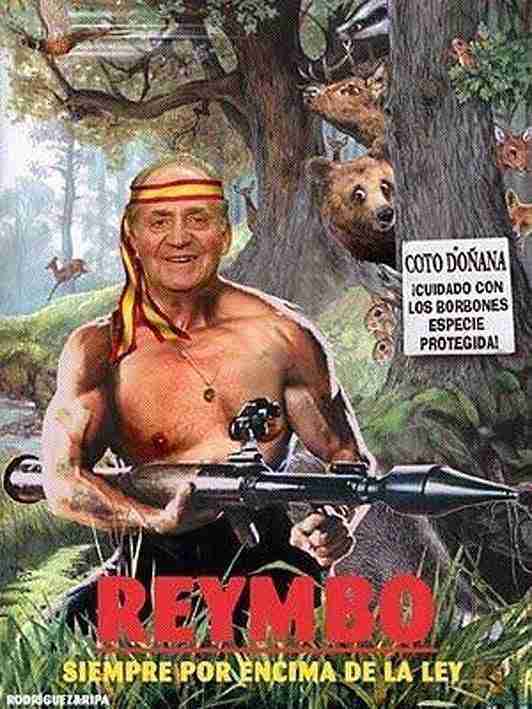 Not only were his actions seen as incompatible with modern ecologically enlightened values, but he was himself intimately associated with conserving endangered wildlife through his role as the Honorary President of the Spanish WWF. Reymbo, always above the law at Doñana National Park. "Be careful of the Bourbons, protected species! ", via The Royal Correspondent. Botswana is one among many countries that generate income by organizing these kinds of tourist safaris where anybody with enough money can sign up for a hunting trip that allows them to pick and choose from a shopping list of animals, each with its own particular price on its head (or horns, or hooves, or hide). 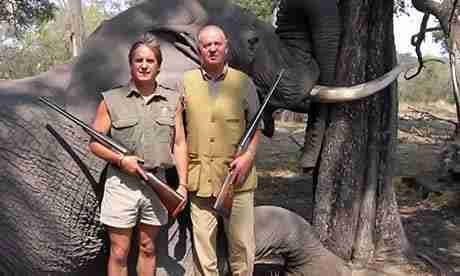 The safari Juan Carlos took part in values each elephant at around $15,000 to kill. Although the hunters might believe that, in the act of finding and killing, they are engaging in an authentic and extraordinarily intimate encounter with wildlife in Africa, these animals aren't really wild things enjoying the freedom of the plains, and the safari hunters have not discovered them by chance. They have been rounded up and made available by the safari tour operators for the purposes of a tourist shoot. With people paying such astonishing prices for the experience, a kill must be guaranteed. There is a name for this kind of activity, and it is "canned hunting": captive hunting that takes place on special game ranches (see below). 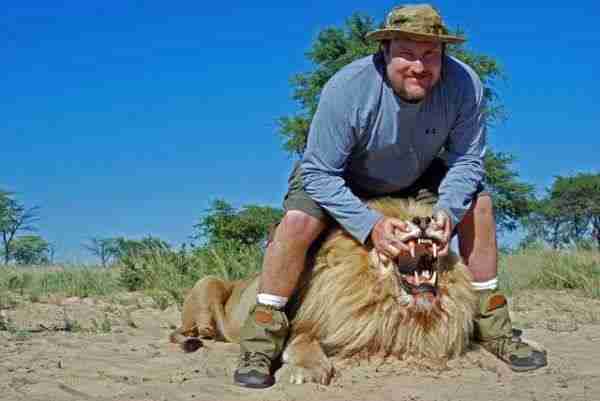 Canned hunting tourist in South Africa via Reluctant Mom. While canned hunting has been exposed a number of times in the news, internationally the big focus has tended to be on certain individuals, rather than the practice as a whole. Two of the biggest stories about canned hunting in the news this year have circled around two figures. Kendall Jones, the 19-year-old cheerleader from Texas, was on the end of a significant social media backlash resulting in the removal of many of her photos from Facebook. More recently, a Belgian football fan, Axelle Despiegelaere, who was scouted by L'Oreal at the FIFA World Cup, was the target. Her contract with them was cancelled when her involvement in canned hunting came to light soon after. While these young women have made headlines and their reputations and careers have been damaged by expressions of disgust in the press, one may legitimately ask why this chorus of disapproval has not been directed towards the practice itself. While American and international public anger towards these individuals has brought the practice further into the public eye and resulted in action being taken against them, the practice itself continues unabated, not only across Africa, but in the U.S. For the wealthy in America it is not necessary to go to former British colonies such as Botswana to shoot a wide array of exotic African wildlife such as zebras, lions and oryx as well as the chance to hunt Asian animals, even tigers, the legal framework in the U.S. means that trophy hunters can easily find an American destination where, for a fee, they can kill an exotic animal of their choice. This is no secret, but in spite of public opposition over the years, whether due to legal reasons or possibly the strength of the hunting lobbies, canned hunting continues here. It is estimated that there are over 1,000 such canned hunts in the U.S., with approximately half of them taking place in the state of Texas. The animals made available for these trophy tourists are confined on special ranges, and so they have no means of escaping the sights of loaded rifles. They are often hand-reared and so have little natural fear of people; safari operators lure them into more enclosed areas using food as bait, and in some cases they are tranquilized to ensure 100% success for the hunter. The reason for this is that there is usually a rule of no kill, no fee. While the hunters may believe that they have exerted their dominance over a wild creature, in reality this is no fair game.